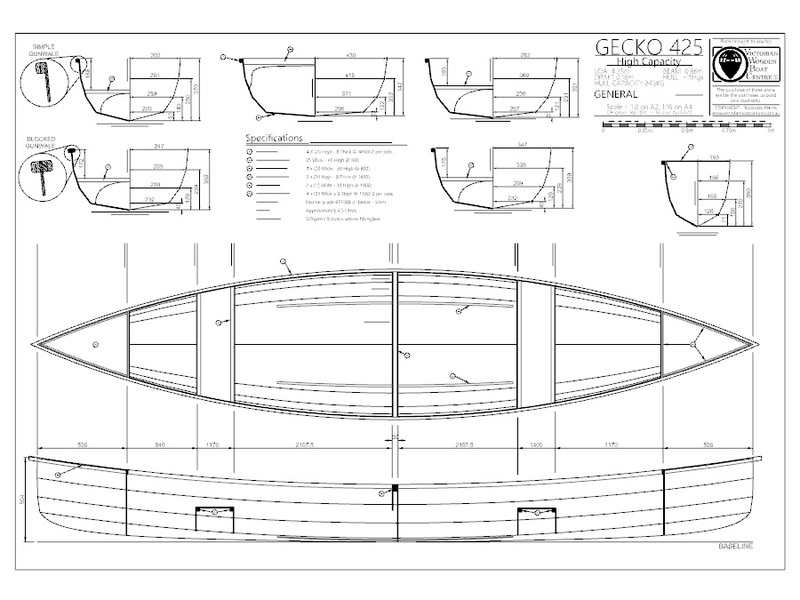 The Gecko range of entry level canoes are a lightweight, cost effective boat, designed as a way of introducing home builders to wooden boat building. The Gecko has 4 planks per a side and is an open style canoe designed with comfort and stability in mind. The hull has a slight vee amidships that tapers off to a fine entry either end, giving great directional stability. Developed with the aid of specialty computer software the Gecko canoe is not only the most accurate design on the market but also the most cost effective. Built with the stitch and glue (or stitch and tape) method of construction, a builder needs no previous experience in order to end up with a fantastic final result. Building with either cable ties or copper wire the builder simply needs to “stitch” the hull panels together and add epoxy fillets and fibreglass tape to finish up. This enables the users to quickly assemble the hull and see immediate results for their efforts. These canoes are designed for general purpose activities and are available in a range of sizes. Plans and kits are available directly from the centre. Plans come with perspective drawings, a suggested nesting pattern and the exact dimension for lofting your own hull; full size patterns for bulkheads and seats are available upon request. The kits include a set of plans and assembly instructions, arriving at your door as fully computer cut panels including 100% accurate stitching holes and asymmetric finger joints for the perfect alignment of panels. This canoe is currently the largest canoe in the Gecko range at a length of 4.25m. Built from 5mm marine plywood this two person hull comes in at around 17kgs depending on final trimmings and paint. The designed seating positions are asymmetric; this allows it to be a 2 person canoe in one direction and a single person canoe in the other. Being easily car toppable, it is ideally suited for camping or family day trips. The combined buoyancy of the sealed end compartments is 70kgs, and buoyancy foam can also be added under the seats if more flotation is required. Purpose: Double adult’s day tripper or single person load with camping equipment. This canoe is a smaller more refined hull with a lower seat that is also a flotation box. Built from 4mm marine plywood this single person hull comes in at around 15kgs depending on final trimmings and paint. This hull was primarily designed for a single young adult by will support the weight of an adult. Being easily car top-able, it is ideally suited for day trips or school groups. The combined buoyancy of the sealed end compartments and the seat are 55kgs like the Gecko375 but at a smaller size. Purpose: Single young adult’s day tripper or single adventurous adult for fun. This canoe is basically a toy. It still teaches all the methods and techniques required in stitch and glue boat building but at a smaller size and cost. A really cute mini canoe. This canoe boasts high floatation, making it totally unsinkable. And can support a surprising load greater than 80kgs. The planking in this canoe also has no joints because the hull planks are exactly one standard sheet long. The planking will consume a single sheet with the additional sheet being for bulk heads, decks and seating only. Purpose: Children’s muck-about or adventure seeking young adult.